Salted Caramel Fudge: Chocolate fudge with a gooey salted caramel topping. You’d never guess this delicious dessert is made with only real food ingredients & is vegan, dairy free, & refined sugar free! Hello! Tiffany from Feel Great in 8 back again with another insanely delicious recipe you can feel good about serving to your healthy kids! I am so excited to share this one with you! It’s that time of year again – the holiday season when neighbor gifts, parties, and stockings will be full of refined sugar, high fructose corn syrup, and all kinds of ingredients you can’t pronounce. Don’t worry though, I have the perfect solution for you! 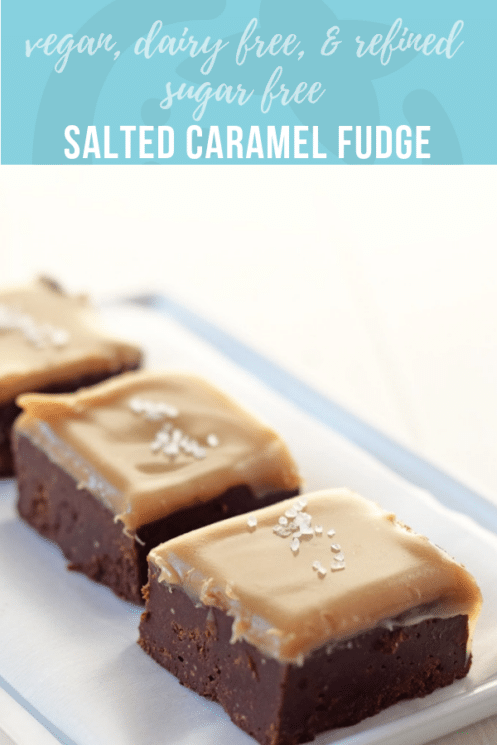 This salted caramel fudge is the perfect treat that you can share! All the while feeling good about eating it. It’s made without refined sugar or highly processed ingredients and with heart healthy fats. Of course, you don’t want to eat the whole pan yourself, but you can indulge in this favorite holiday dessert without any guilt. It’s my gift to you. 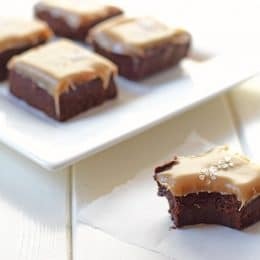 You’ll want to make the chocolate fudge and give it time to set in the refrigerator before adding the caramel topping. I added the caramel too quickly the first time and the two mixed together. Still delicious, but not as pretty as the gooey caramel layer on top. Store leftovers, if there are any, in the refrigerator or freezer. 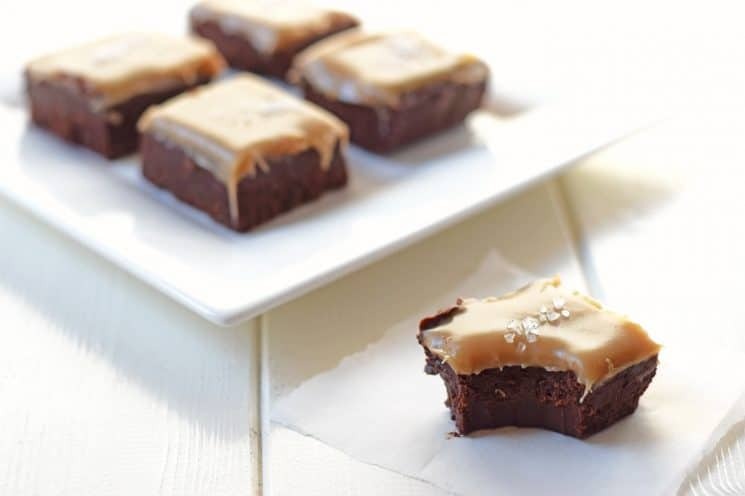 Both the fudge and the caramel will melt and get soft if left out too long. You can substitute any nut butter for the peanut butter in the fudge recipe. I only had chunky peanut butter, so I just put the peanut butter, honey, and coconut oil in my Blendtec for a quick blend before adding the other ingredients. The result was still fudge-y and delicious. To make this recipe vegan just use pure maple syrup instead of honey. In large bowl, blender, or food processor, mix together the coconut oil, peanut butter, honey, and vanilla. Add the cocoa powder and salt and stir until mixed well. Pour mixture into a small container lined with parchment paper. I used a 6×9 inch glass casserole dish. Spread into an even layer and refrigerate or freeze for at least an hour before adding the caramel topping. While the fudge sets, prepare the caramel sauce by following the recipe below. 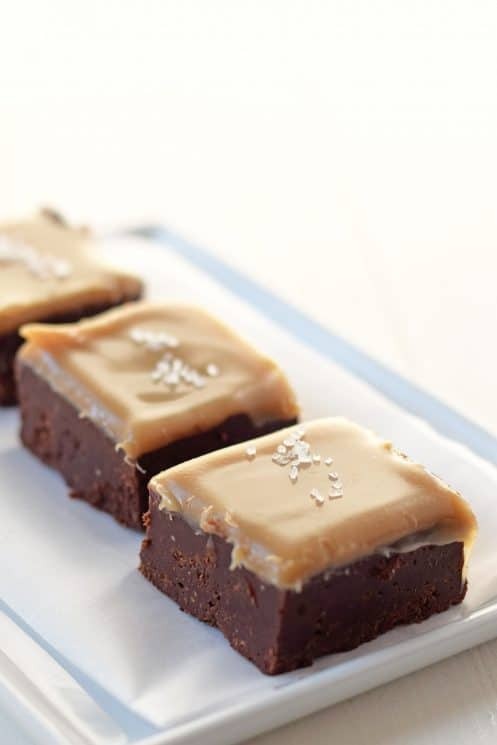 Pour 1/2 cup of the caramel sauce onto the fudge and spread to cover evenly. Sprinkle with course sea salt, cut into small squares, and enjoy! In a large saucepan with a thick bottom, combine coconut milk, maple syrup and salt. Bring to a boil over medium-high heat. Reduce the heat to medium-low and let simmer for about 40 minutes, stirring occasionally. Add coconut oil and cook for another 5 minutes, or until it reaches a deep caramel color. Stir a little more often towards the end to keep the bottom from burning. Remove from the heat, add the vanilla, then poor the caramel into a bowl and let it cool for about 5 minutes. Once it has cooled slightly, stir vigorously until it is smooth and glossy. Use the sauce while it is still warm for the best spreading/pouring results. Stir leftovers (if there are any) in the fridge and reheat in a double boiler. Beautiful slice, so yummy and lite to eat. Perfect for those PMS induced sugar cravings! My caramel didn’t set. Thickish, but after 5hrs still runny. I cooked it for the full 45 mins but used coconut cream – could this have affected it? Any suggestions. Hi. The link to the caramel sauce will not work. I get a 503 error, whatever that is. Thanks. We have tested this and it works for us! This is the link just in case you can’t get it to work http://blog.feelgreatin8.com//homemade-caramel-sauce/. I can’t get the caramel sauce to simmer, it’s kind of exploding?! Even on the lowest heat it seems to bubble in violent bursts…is this normal? I stupidly used the light coconut milk. Not thickening sadly and husband not impressed with the maple syrup budget! Ops! Noticed on th other link the coconut milk was also a smaller quantity. Fudge was amazing though! Dying to try cashew or pecan if husband doesn’t see the shopping bill! Can i use something other than honey as im a strict vegan and honey is a animal by product. Shelia, you can use pure maple syrup in place of the honey to make it vegan. Why only use half the caramel sauce? Could you just make half in the fiest place? Is there an alternative to peanut butter as I’m allergic to nuts! This is still a very high calorie and high fat treat. While it may be all natural, I would only eat this sparingly and it is still truly a treat. For some weird reason the sauce stayed some kind of liquid. Even after a few hours in the freezer. I blame the brand of coconut milk.